It is possible to have your scone, or your jaggery dosa, and eat it too. And today I’m going to show you how. 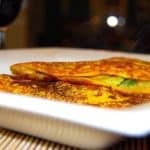 My Jaggery Dosa is a traditional South Indian snack, and it’s one of the easiest treats to throw together on a busy afternoon. Jaggery Dosa is quite healthy by itself, made as it is with whole-wheat flour, rice flour and jaggery, an unrefined sugar used in many Indian sweets. 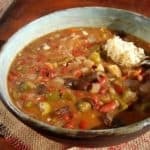 I made mine even healthier by using brown rice flour. For those who are not familiar with jaggery, this is a golden-brown sugar usually sold in blocks and sometimes cubes in Indian grocery stores everywhere. Eaten by itself, jaggery is almost cloyingly sweet. But added to traditional Indian sweets it has a richness and depth that sugar just cannot emulate. A favorite snack in Maharashtra, the state where I grew up, is to eat a handful of roasted peanuts with a smidgen of jaggery. One of my uncles, Bhau mama, loved it so much that as children we would know he was about to visit, even without being told, when my mom would put the tava, a slightly curved griddle, on the gas stove to roast peanuts. His eyes would twinkle, literally, when she put the plate before him. Desi’s eyes twinkle when I put before him my jaggery dosa, because it is a snack he grew up eating in his Tamil home. Jaggery is great in sweets because it forms a perfect marriage with cardamom, the intoxicating spice so integral to so many amazing Indian sweets. I made my jaggery dosa healthier by adding to it brown rice flour instead of regular rice flour. 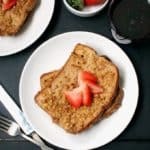 I got this from iHerb where I also got some other wonderful organic and wholegrain flours, including the oat flour and the barley flour that I used in my Oat and Barley Scones. The scones, as the name suggests, are wheat-free (although not gluten-free, as I’d earlier said, because one reader points out barley does contain small amounts of gluten– I stand corrected). The absence of wheat gives these scones a really crumbly, light texture that’s fabulous. My favorite way to eat these is with a dollop of vegan whipped cream.To sweeten my scones, I used another non-traditional sweetener: agave nectar. Because agave is a low glycemic index food, meaning it is absorbed slowly by the body, it is much healthier for you than regular sugar. I also love its caramelly, nutty taste that I think enhances just about any baked good. At the suggestion of a reader who tried my Black Currant Scones, I also decided to substitute some of the fat in the recipe for heart-healthy olive oil, and it worked beautifully. I am sending the scones over to Champa aka BangaloreBaker’s Bake-off. 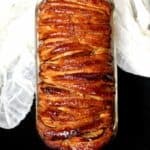 So here without more ado are the recipes for two traditional snacks, one from the east and the other from the west, both healthier than their original avatars but just as yummy as they were ever intended to be. Enjoy, all! 1/2 cup jaggery mixed with 2 tbsp water. Place in a small saucepan and over medium heat until the jaggery has melted smoothly into the water. You don't want any lumps here. Set aside to cool. Mix the flours, salt, cardamom and cashewnuts. Add the coconut milk and jaggery and add just enough water to make a batter that's pourable. Heat a non-stick or cast-iron griddle until a drop of water skitters and evaporates quickly. 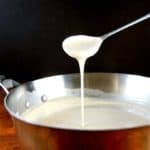 Using a round-bottomed ladle, pour about 1/3 cup of the batter in the center of the griddle. Quickly spread the dosa by spiraling the batter outward, using the bottom of the ladle. You can sprinkle a few drops of oil around the edges of the dosa to get it crispy. This also helps release the dosa from the griddle. But if you'd rather omit the oil, do so by all means. When the dosa is golden-brown on the underside and comes of the griddle quite easily, flip it over and cook for another 30 seconds or so. Serve hot. I like mine with a dollop of vegan butter. Mix all these ingredients together and set aside. Mix with a fork until the mixture comes together in a ball. Place the ball of dough on a lightly floured surface and pat out with your hands into an 8-inch circle. With a pizza cutter, as you would a pizza, cut into eight equal-sized wedges. Place each scone about an inch apart from the other on a lightly greased baking sheet. Brush the tops lightly with a mixture of equal parts of olive oil and soymilk for a golden finish. You can also sprinkle some sugar on top for more bling. Bake in a 425-degree, preheated oven for about 16-18 minutes until golden-brown. Cool for a few minutes on a rack and serve warm. I must try jaggery! Love iHerb. 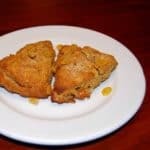 I haven’t done too much gluten-free baking, but I’m such a sucker for scones I’m gonna have to try this! I never made scones b4 but knowing that these are dairy free.I gotta try to make these.Plus the picture makes my mouth water.Yum! !iHerb has many naturals things..wow. Both the dosas & scones look yummy.. I’m sure my son’s gonna love those jaggery dosas.. Will try soon. First time hearing about iherb–lots of neat products there. Both recipes look amazing. Could you substitute stevia for agave, perhaps? I would love to to win the iherb giveaway! The sweet dosa looks really good. I have never heard of jaggery before, thanks for letting me know what it is! I’ve heard really great things about iHerb. It looks like an awesome site. I should point out though, that your scones are wheat free but not gluten free. Barley also contain gluten, although it better tolerated by some people with gluten sensitivity. It’s great, however, to try out wheat alternatives, as wheat has been changed so much in our country that many people are sensitive to it. 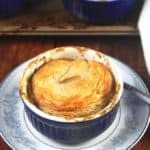 Thanks for more great recipes! My mom used to make this often when we were growing up. Brought back memories. Love the scones too. That dosa sounds wonderful! Thanks for having the giveaway. I’ve been wanting to try out iHerb. Believe it or not, I am still to try or taste a scone! Have read all about it in Enid Blyton’s … sounded so ‘foreign’ back then!! hehehehe!!!! A giveaway is a great idea! I love scones. Scones make me so happy! I totally want these now! I am going to make those scones tomorrow; they look amazing! 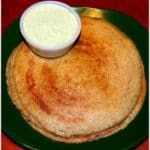 hey jaggery dosa looks tasty..never tried but sure to give it a try.. 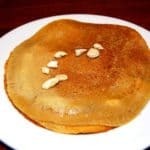 I make jaggery pancakes with wheat flour … never tried a dosa … too good Vaishali! Thanks so much for hosting this giveaway. It looks great! I’ve got my fingers crossed double. I’d love to enter the contest too… but even if I don’t win, thanks for the great recipes. The dosas and the scones look so heavenly…wish I culd grab a bite…lovely pics. A sweet dosa? Hmm, I’m still trying to wrap my head around that one! Loved your variation of jaggery dosa, mine uses only whole wheat flour, jaggery, cardamom and fresh coconut. I am surely going to give your version a try soon and the barley oat scones sound fabulous ! Great looking scones! Those are the best brunch item at leat my favorite! Thanks for a nice giveaway! thanks for the chance to when such an interesting giveaway. Love your recipes & have made a couple of them for my family & it was really wonderful good tasting healthy food. Wow jaggery dosas,yumm yumm.. When I was growing up this used to be my regular evening snack. I wish I lived close to your place cos I feel like eating them right away 🙁 Addition of coconut milk in the Vella dosai sounds new to me.The barley oats scones look lovely too. Wow! I love iHerb! Sign me up for the contest! I have very fond memories of jaggery dosas too ! my mom used to make them when I was a kid 🙂 …Your scone recipe looks yummy ! Cant wait to try it ..You have a wonderful blog here ! Next weekend it will be Jaggery dosa for lunch. Multigrain scones! !Thanks for the recipes. iHerb givaway!! Look forward to both. I also prefer to do most of my shopping online and appreciate your tip about iherb since that is new to me. Thanks also for all of your wonderful recipes. I can’t wait to make (and eat) the dosa. I’m a new reader and I must say, I LOVE this post!! I’m a carb lover, so if I win this giveaway, I’m totally buying some barley to make these barley oat scones…yum!!! I am so glad I stopped by here, I love scones and I think these barley oat ones recipe is a keeper. Definitely going to try these. I must also look into online shopping. I’m excited to try the jaggery dosas! 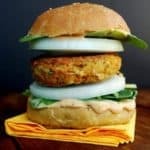 I’ve been slowly working my way towards veganism for some time and I’ve discovered that having recipes for healthy vegan treats on hand will keep me from grabbing a piece of cheese or a cupcake. Jaggery dosa and scones look so delicious! This is one of my favorite vegan blogs, but that jaggery dosa was just over the top!! I tried your brown rice dosa now I MUST try this jaggery dosa! Both these recipes sound great–and so does the giveaway, i’d love to experiment with more herbs and spices! Sweet Dosa and scones, I should try it for kids! Thanks for such neat recipe idea. I made the Scones last night! 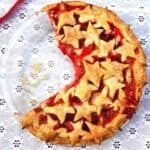 And I am now eating one this morning with homemade raspberry jam. Om nom nom. Thanks for the recipe! Jaggery dosa is new to me and looks very delicious! Yay I love giveaways! The Jaggery looks great thanks for the recipe! Perfect timing as I have left over oat flour from an addicting vegan cookie recipe. This will be my first time trying barley flour which is exciting. Thanks for having a contest to encourage my first comment:) Thank you for sharing with us. 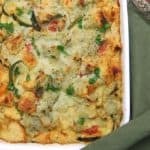 This is one yummy treat I used toenjoy in my mother’s kitchen.I should ask her todo it as she is visiting us.What is more appealing in this post to me is the iherb website I got introduced and I was lost init yesterday couple of hours. I came across yr blog from suggestions on my google reader. I have to admit, its very impressive. I tried methi malai mattar (although it was from someones else’s blog) and it was yummy! Thanks! The jaggery dosa got me scooting here. I have to end my dosa nights on a sweet note, for i make a sugar dosa only for myself.. stiff and caramelized as dessert. I am going to give these a try; sounds wonderful. I cant wait to try the scones this weekend after I go shopping for Barley flour. The next time I’m in the Indian district I’ll try to find some Jaggery– so I can get the full experience with the dhosas. I still find vegan baking tricky, so thanks for the inspiring recipes! The dosa looks good. I love using brown rice flour. Love jaggery dosa. Great blog. Vaishali, Thanks for the entry. It’ll be on this Friday’s roundup.